Dr Jeremy Ganz, a retired neurosurgeon from Cumbria with professional service in Norway, spoke to Dumfriesshire and Galloway Natural History and Antiquarian Society (DGNHAS) on the subject of The life and contributions of James Hill, Surgeon in Dumfries. In the 1980s he completed a PhD on epidural haematoma, bleeding in the head. He came across a monograph, written by Jacobson of Guy’s Hospital in 1886, in which 70 historical cases had operations in the head; 13 survived. Two of the 13 survivors were treated in Dumfries by James Hill, who reported on them for up to 14 years afterwards. He is 'an undeservedly forgotten celebrity'. Dr Ganz outlined the period prior to the birth of James Hill, (1703–1776). His father, also James Hill, (1676–1743), graduated MA Edin. in 1691 and was ordained in 1699. Murray’s Literary History of Galloway states that he was the first Hill to come to Galloway. He served as minister in Kirkpatrick Durham Parish, 1657–1672, where there is a monument to him. According to Fasti for that parish, 'he was a man of piety … but much under the influence of melancholy.' He was ousted because life then was characterised by religious intolerance. He began to conduct conventicles, regarded as a crime punishable by death. James’ mother was Agnes Muirhead, daughter of James Muirhead, bailie of Dumfries. She was only 6 years old when her father died in custody in Leith for non-conformity. The parents were married in 1702. James, the eldest of 12 children, is referred to in Fasti as James of Blaiket, parish of Urr. There is no documentation about his childhood. There was a schoolmaster in Kirkpatrick Durham, but the charge for teaching writing was greater than for reading. Evidence of James’ poor handwriting was displayed on the PowerPoint presentation. Two of the children became surgeons: Robert died in Jamaica in 1737. James was trained in Edinburgh. His training was in the form of an apprenticeship, not a university education. The fee was costly at 500 merks. He was trained by George Young, an able but unpleasant man, who later resided in what is now Brodie’s tavern. The name ‘Monro’ is very significant in Edinburgh medicine. Three men by the name of Alexander Monro occupied the chair of Anatomy for 126 years. It was Alexander Monro, primus, in whose class Hill studied. He acquired his diploma in 1713 and joined the navy until 1732. Operating skills were not included in his training, but they could have been acquired at sea. He settled in Dumfries in 1732. In the following year he married Ann McCartney, through whom they acquired Blaiket as a home. She died in 1742 at the age of 64. Noteworthy events attending those early years in Dumfries were the building of the Caul; the erecting of the Midsteeple in 1707; and the Act of Union taking place in 1707, creating a period of great unrest. The parents’ personal life was much affected when a son Robert, aged eleven, was drowned in the Nith. Hill practised in English Street, where the County Buildings are now located. He served as a GP as well as a surgeon and dispensed medicine, as was the practice in Scotland. It must be remembered that there was no general hospital in Dumfries until 1776. Hill’s remarkable book, Cases in Surgery, was published in 1773. In it he tabulated the results of cases of cancer, a practice novel for the time, and, as he knew his patients over a long period, he was able to follow up the cases for many years, another practice of merit. His case recording lacks cohesion but the information is nevertheless all included. His wound management was simple and involved no tissue loss. In those days before X-Rays incisions were made for inspection as well as therapy. In the field of trepanning, entry of the skull, he had successes worthy of mention. There were two procedures: circular and cruciate, the latter of which went back to the teachings of Celsus, 2nd Century AD. Hill did not favour it because the flaps of the cross hampered inspection. Hippocrates, 5th Century BC, taught that blood collection at a wound turned to pus in the body and with trepanation he recommended letting out the blood at a fissure. Hill rejected that teaching. He only trepanned if, following a head injury, there were symptoms of headaches, vomiting and drowsiness. He also noted brain pulsation carefully and was the first to do that in modern times: this had been done by Galen , 2nd Century AD, but it had been forgotten. He did not operate when it wasn’t necessary. He treated four cases of epidural haematomas and all survived. His treatment relieved cranial pressure without knowing what it was. Patients were referred to him from further afield and even from England. Hill was greatly respected for 100 years after his death. The gravestone of this 73-year-old man, is in St Michael’s Churchyard on one of the handsome memorials backing on to Brooms Road. It states of James Hill: 'To a very superior skill in his profession, he joined a sense of science, which he cultivated to the latest period of his life. His benevolence to the poor who had not then the resources of an Infirmary, was unwearied. Here also lies the remains of Ann McCartney of Blaiket, his spouse.' The names of six children are mentioned. Very few people nowadays have heard of James Hill because there was no big medical institution to keep his memory alive historically. 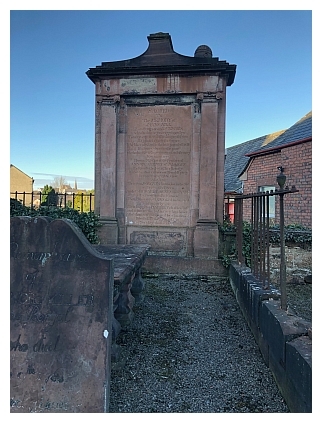 Dr Ganz is to be congratulated for publicising the work of this eminent surgeon who for 30 years achieved notable success in treating difficult cases long before anaesthetics became available in the middle of the 19th Century, again in Dumfries early in the history of their introduction. Dr Ganz believes that Hill merits a blue plaque if an appropriate site could be found, in the absence of an extant building associated with him. How about somewhere in the vicinity of the County Buildings! James Hill's grave in St Michaels graveyard. Photograph by John Williams.